When a buyer decides to purchase a vehicle in the competitive midsize sedan segment, by and large, they know what they’re getting. They’re doing their best to get a vehicle that offers an accommodating interior cabin, a performance profile that is equal parts powerful and efficient, and is appealing to look upon. And two currently available models -- the 2017 Mazda6 and 2017 Honda Accord -- are regularly mentioned among the best around. So, how do they compare to each other? Under the respective hoods of the 2017 Mazda6 and 2017 Honda Accord, buyers are treated to two engines that are relatively similar in terms of displacement and performance output. The Mazda6 employs a 2.5L inline four-cylinder engine, whereas the Accord offers a 2.4L inline four-cylinder; this results in a slight edge in terms of horsepower for the Accord, while the Mazda6 holds a small advantage in fuel economy and torque rating. Additionally, the Mazda6 offers a starting MSRP slightly below that of the competing Accord. Find Your 2017 Mazda6 at Avondale Mazda today! Although the performance of the 2017 Mazda6 is generally the first thing that buyers discuss, it’s far from the only feature that recommends this model to prospective buyers. 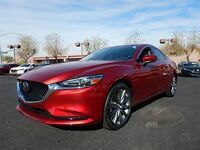 Tech features include the standard MAZDA CONNECT™ infotainment system, which pairs with a full-color touch-screen display to offer access to streaming music and turn-by-turn navigation. Meanwhile, with an available BOSE 11-speaker surround sound system and optional i-ACTIVSENSE® safety innovations, convenience and safety are a priority as well. When a buyer is looking to upgrade the design of their 2017 Mazda6 purchase, they have the option of enhancing comfort and style with the available high-grade Nappa leather upholstery. LED headlights are also available, as is a power-sliding moonroof. The 2017 Mazda6 is now available at Avondale Mazda, located near Glendale and Peoria, just outside of Phoenix, AZ. To learn more or to schedule a test drive, visit Avondale Mazda today!